A view of the battle at the end - Union on the left. Also shown is Anthony's neat terrain.I leapt into the taxi and headed up to Bukit Timah to Anthony’s for an American Civil War game. Anthony has been working on terrain and setting up a games room so Sunday night was to christen both the terrain and the room. I was happy to be going up to Bukit Timah as well as it is a part of the island I have not seen yet. Nice area and the signs telling me not to feed the monkeys were encouraging – I wondered whether I would eat. Armed with a packet of Pringles and a six-pack (of Chang, not of abdomen) I arrived around 7. After negotiating my way through the condominium grounds (you know it ain’t going to be easy when Anthony is in block 91) I managed to find the right condo. Anthony had decided to christen the room with an American Civil War battle as he had the figures for both sides ready to use. The rules being used were the On To Richmond rules, written way back in 1983 and published by the now (I believe) defunct The Courier magazine. 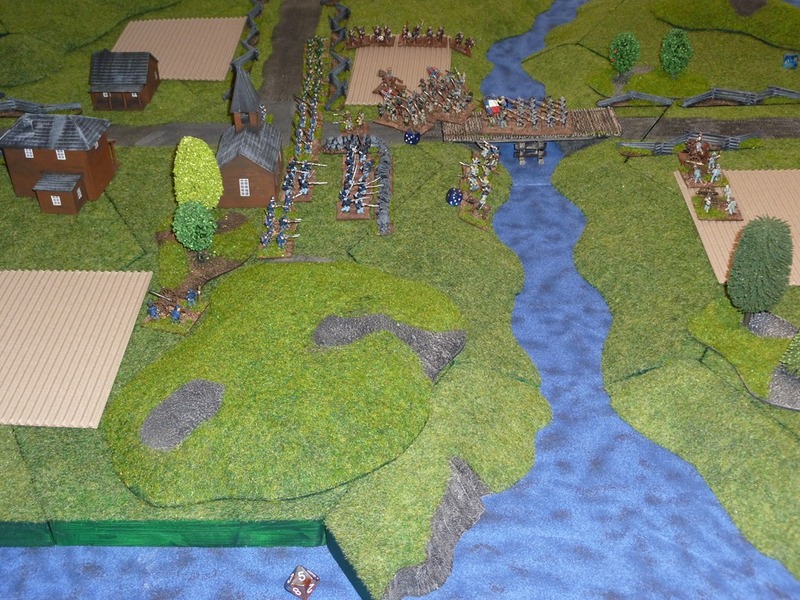 The scenario we were trying was a Union division of 5 brigades and a battery were tasked with defending a river crossing and town from two attacking Rebel divisions supported by three batteries. What made the task even more difficult for the Union was that three of their brigades were off table at the time, set to come on at an unknown time in the future. The Rebels came forward, the Union fired, the Rebels disappeared. The Union were lucky as their reinforcements arrived early and from a direction that allowed them to both support the centre and enfilade Rebs arriving from the bridge. A great game and I can see some regular gaming coming up in the future – possibly Wednesday night games! Thanks for a great night mate! It's always nice to christen a new games room with a loss. And maybe a few rounds of artillery "softening" up should have preceded the rush over the bridge, but truthfully I think the scenario (and therefore its my fault) made a difficult task for the Rebs. It was a fun evening and I can see more ACW games in the future since it is the one period that I have two forces.